Saw a Mercedes 600SEC today! At least I think it is. For the 1993 model year, Mercedes-Benz launched the C140, and the flagship was the V12 600SEC. 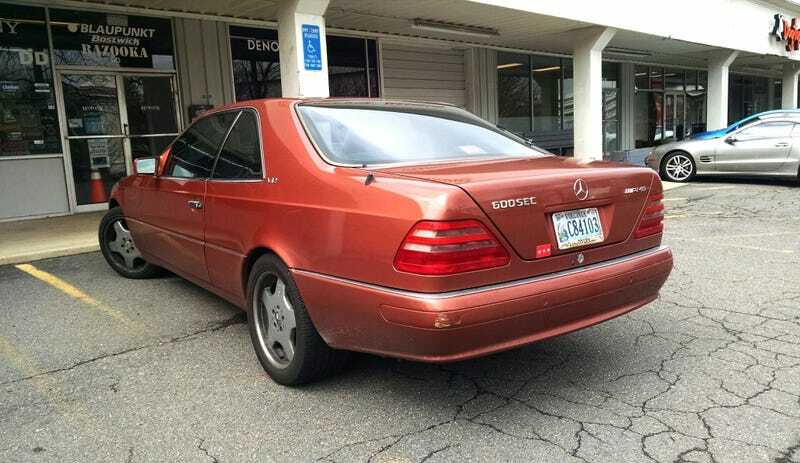 By 1994, it had been renamed the S600 coupe, and in 1998, it became the CL600. So if this is a real, honest-to-goodness 600SEC, it can only be a ’93. Is there any reason to believe that it might be a later C140 with a phoney-baloney 600SEC badge? I know the AMG badge certainly isn’t original. I dig the paint color. I can only describe it as “metallic tomato,” and I don’t think I’ve ever seen it before. Any idea if this is a factory color? A friend told me it might be a color called Inkarot, but a quick GIS tells me that’s probably not it. I always loved these cars. I still want one. I just can’t afford to maintain one, especially with a Phaeton in the garage.